For the first of a 5 part series documenting our NYC trip, we head to Chinatown's Trademark Taste + Grind for a sit down with Beverage Director Will Benedetto, who oversees all of the programs for the hospitality group In Good Company. 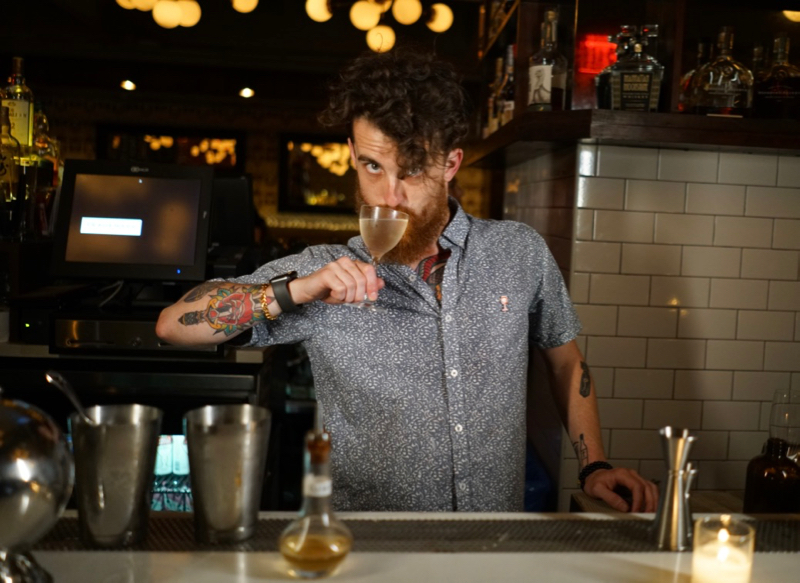 Will, who coordinates everything from the group's nightclubs, beach bars to its high-end rooftop bars and jazz clubs, sat down with our team after a few rounds we so gladly got to film, and talked about his journey as a bartender. I fell into bartending. In hindsight, I suppose it makes sense. I remember when I turned 21 my mother gave me a Mr. Boston cocktail book and I was enthralled with the recipes. That passion stuck and though I studied music, once college was finished, I needed another way to pay the bills so I landed a gig as a barback. I was also working security at a music venue at the time. I'd go to this cocktail bar crammed behind the venue after my shifts and just pestered the bartender, ranting about all of the nerdy stuff bartenders are into. Persistence paid off and eventually, the bar manager gave me a few shifts behind the bar. From there I just sort of never stopped aggressively learning and attacking opportunities. It's been a wild ride! Do you have a favorite recipe to build? What about a particular spirit? I love the Old Fashioned especially. It is a blanker canvas than people think! I knew a composer back in my undergrad who talked about how being 'confined' can foster creativity. I think within the basic architecture of spirit, sweetener, and bitter there is so much you can do. There's no reason you can't use more than one spirit to create the base and there are endless possibilities with sweeteners and bitters. At the Fox Bar and Cocktail Club in Nashville, we've really been exploring this. Our Exotic Old Fashioned features Toki Japanese Whiskey, Sipsmith VJOP, Gingery Syrup, and Peychaud's bitters and (shockingly to me) people love it! How do you see the bartending profession today? The bartending profession offers more opportunity today than ever before. I've seen bartenders land high paying brand gigs, move to Marketing and PR firms, get into the production side of things, move into ownership, or create a sublimely fulfilling career behind the bar. Since the beginning of my career, I'm excited to see this massive shift towards sustainability and wellness within our industry. What’s with NYC and Mezcal these days? Got a favorite or a recipe? Mezcal is just such a remarkable spirit. Before you can even consider making a Mezcal you have to grow and nurture agave plants for nearly a decade. Sometimes longer! So Mezcal has this unique property of being almost Terroir driven. I've had the great fortune of coming across a number of mind-blowing Mezcals but my favorite producer is hands down Ilegal. The Mezcals they bring into my bars are always superb. Right now, I'm sipping on a neat pour of their lot 54 Reposado that I pretty much begged one of their reps give me. It's unreal. When can we expect you for a guest shift bartending in LA? Thanks to our friend @thirsty, which introduced us to Will, or @yungwillionaire - not pictured here - we were actually waiting for him to wrap things up! LA is high on my list. It's been a busy year but I keep hearing about great new bars opening up in LA and I've been fortunate enough to meet some amazing people from the bar community out there. There are some really interesting distilleries also, and I'm also looking into a new collaboration with the guys at DRNXMYTH. I also had a blast filming alongside with The Best Drink Ever so we're hoping we can do more videos in the future, especially on your turf! At the end of the day, this industry is about being hospitable but also about having some fun! Trademark Taste+Grind is a retro haunt restaurant located in the Hotel Le Soleil with an exclusive New American menu (did someone say beef tartare? ), creative cocktails & a boutique coffee bar for the New Yorker on the go and patrons of the adjacent hotel. Trademark+NYC is among In Good Company's wide portfolio of restaurants and bars. Currently, the portfolio also features The Roof at the Refinery Hotel, Winnie's Jazz Club, Parker among many others. The Don't forget to follow #TBDExNYC this entire month for some more amazing NYC cocktails and exclusive stories from our trip!